Sun., March 6, 2016, 10:23 p.m.
Stefan Frei titled Seattle’s 1-0 loss to Sporting Kansas City in its 2016 MLS season opener the Life of a Goalkeeper. In the 73rd minute of Sunday’s match at CenturyLink Field, Kansas City defender Nuno Coelho took a speculative shot from well outside the Sounders box. And though the shot swerved between a few bodies, Frei still had plenty of time to size up the trajectory of the ball. Somehow, though, it wriggled beneath his outstretched body, brushing his fingers before nuzzling into the back of the net. He wasn’t the only Sounder frowning critically afterward. Jordan Morris mourned the chapter ripped out of his storybook, recalling the moment he found himself alone on goal less than nine minutes into his MLS debut. Clint Dempsey had found Andreas Ivanschitz, who played Morris into space. But despite a clean look, his shot sliced over the crossbar. Oniel Fisher turned a promising 41-minute stint into a net negative with a single two-footed challenge, earning the red card that left the Sounders shorthanded for the rest of the game. There was very minimal contact, but there’s no excusing the intent, a challenge that could have done legitimate damage if Connor Hallisey was a split-second slower. Fisher was sent, chastened, to the locker room. And the game, which had strolled through a mostly tame first half, changed in an instant. Sporting’s edge in total shots continued to rise, but Ivanschitz came the closest to opening the scoring early in the second half when he smashed a shot off the bar. In 11 of the 12 previous all-time meetings between the clubs, they’ve combined for three goals or fewer. Every single one of them has been decided by a single goal or fewer, and Seattle scored in the 90th minute or later in six of those matches. Sunday’s match was typical: Composed and physical. This felt like a game that would be a defined by a single moment or lack thereof. Then Coelho stepped into space and fired. 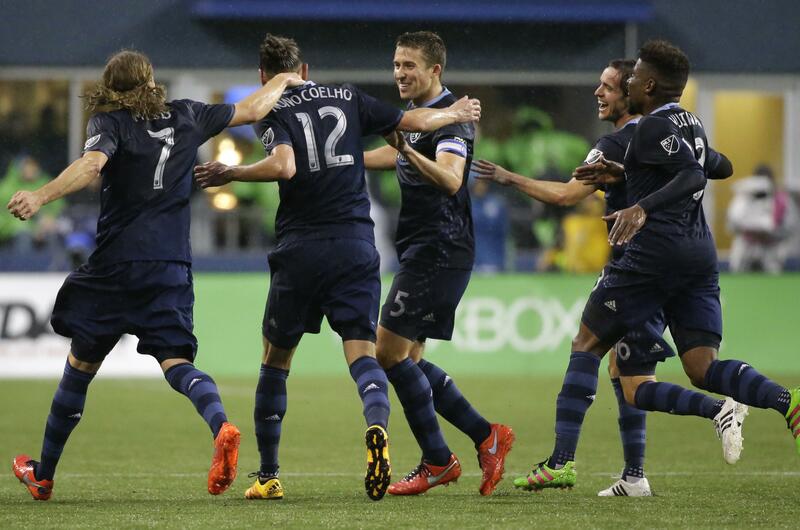 Frei shook off suggestions that the wet turf played a role, even though Sporting Kansas City goalkeeper Tim Melia said it does increase the speed of shots that skid off the surface. Frei said he saw the shot the whole way. The goalkeeper stood in front of his locker and tried to articulate the weight of a loss. It was Game 1 of 34, and there are plenty of opportunities for redemption. The red card was an extenuating circumstance, and a late Sounders game-tying goal would have deflected some of the blame. But the Life of a Goalkeeper doesn’t allow for such caveats, at least not for a few days. “The battle with that mistake is not over for me,” Frei said. “This is where the hard work starts, to mentally get over that mistake. Only goalkeepers understand what goes through your mind, and the battle that you have in your mind when something like this happens. Unfortunately, it does happen. It happens to the best of them. Published: March 6, 2016, 10:23 p.m.